As promised, here is a Whimsy Diet dessert recipe! I found the original version on Pinterest (follow me here) and tweaked it to my liking. This cheesecake is made with Greek yogurt rather than cream cheese, so it's fairly guiltless! The final result is reminiscent of a Sarah Lee cheesecake. I forwent the labor intensive traditional crust and chose to make this cake mix-based crust instead. *I opted for a yellow cake mix, although I'd like to try a white one next time. Make the crust first. Spray a 10-inch springform pan with cooking spray and set aside. In a large mixing bowl, combine the eggs, sugar, yogurt and vanilla with an electric mixer (original recipe calls for a blender or food processor - this is not necessary). Mix until smooth, then add cornstarch and pinch of salt and mix again. Pour filling into hot crust and bake at 350 for 35 minutes. When the cheesecake is done, it will still be jiggly in the center but will have a “done” look to it. The edges of the cake will start to pull away from the sides of the pan. Make sure you don’t over bake. Let cool, then chill for 2-3 hours in the fridge before releasing springform. 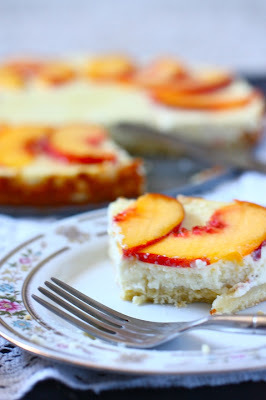 Arrange sliced peaches over the top of the cooled cheesecake and drizzle with honey! My boyfriend is always skeptical when I try to make our tried and true recipes healthy. This time, though, he was pleasantly surprised and ate several slices over the course of the weekend! Needless to say, this cheesecake is a hit! *Tip: I suggest doubling the filling recipe and halving the crust recipe for the best cheesecake to crust ratio. It's definitely worth giving a try! YUMMY! I've never tried a cake mix crust but I love using greek yogurt in cheesecake filling. This looks so yummy! I've been looking for a light cheesecake recipe. Will definitely try! oh my this looks so good.